Urban Village, Seattle 2035 and HALA informational meeting this Wednesday! 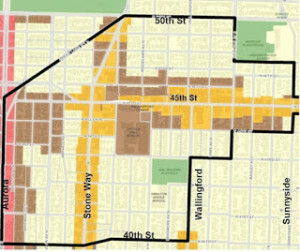 The Wallingford Community Council will hold an Urban Village, Seattle 2035 and HALA informational meeting on: January 20th, 2016, 7:00 – 9:00 PM at the Good Shepherd Center, 4649 Sunnyside Avenue North, in the Chapel on the 4th floor. The Wallingford Community Council wants you to know of major changes proposed in our neighborhood. Mayor Ed Murray will soon finalize recommendations to the Seattle City Council to revise the basic planning laws that govern what can be built on your and your neighbors’ property. Mayor Murray has teamed up with developers and with advocacy organizations that promote housing density and want to change the way we live. Their first step is changing the City’s Comprehensive Plan through the Seattle 2035 process, followed by zoning changes recommended in the Housing Affordability and Livability Agenda (HALA) plan. We believe these proposals will not create more affordable family housing or more affordable apartments, other than a few subsidized units. Eliminate requirements to include residents’ input in changes to neighborhood zoning and other aspects of the Comprehensive Plan. Make it much easier to rezone any property in or near the Urban Village from single-family to multi-family. Eliminate specific zoning types within the Urban Village from the future land use map. Revise descriptions of single-family areas, making it easier to rezone to multi-family. Again permit “skinny houses” and houses built on sub-standard lots. Remove protections for trees and goals for more trees. Permit more development on steep slopes and in environmentally sensitive areas. Eliminate parking requirements for apartment complexes. Change all single-family zoning within Urban Villages to multi-family zoning. Greatly increase the allowed heights and size in multi-family zones (from 3 to 4 or 5 stories) and in commercial zones (from 4 to 5 or 6 stories). Push out locally-owned small businesses that cannot afford the higher rents in new mid-rise mixed-use buildings. Accelerate demolition of existing affordable housing. Replace affordable housing with “top-dollar” houses and apartments. Increase rents for non-subsidized apartments. Create new legal “loopholes” for developers. Make these changes despite City studies confirming that existing zoning is adequate for predicted future population growth! This entry was posted in Land Use, WallHALA on January 18, 2016 by WCC Communications.